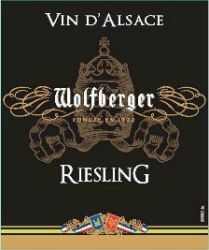 " We don't sell the wine without touching the vine "
Wolfberger Alsace Riesling is 100 percent Riesling. Riesling is the most popular grape variety in Alsace. Racy yet slightly fruity, Wolfberger Riesling is a subtle fine wine of citrus and mineral aromas, good acidity and freshness. It has been known for being the perfect "food wine" - great with traditional Alsatian dishes such as sauerkraut, but also, thanks to their vivacity, with fish and shellfish. A very slow-growing variety, Riesling ripens with chilly nights. The leaves are round and thick with sharp teeth. The berries – small, green or yellow, with thick skin – grow on a short-stemmed, cylindrical, compact cluster. The Reisling grows best in soil that isn’t too rich, with a preference for light terroirs with lots of sunshine. After the harvest, the grapes are put into horizontal pneumatic presses where the juice is slowly extracted. After crushing the grapes, the juice (actually the must, which includes the skins, stems and seeds) is stored in different vats, then it is carefully clarified. Fermenting in temperature-controlled stainless steel vats for 3-4 weeks. Racking. Fining (3-4 months). Filtration and stabilization, then aging in the bottle. Excellent with grilled fish or cooked in a sauce, and shellfish. Wolfberger is a union of producers located in Eguisheim, south of Colmar. The city was also the home of Pope Leo IX, the Reformer (Pope from 1048 – 1054 A.D.). The winery was founded in 1902 when a group of wine-growers in Eguisheim decided to join forces to create one of the first cooperatives in Alsace. The cave counts 800 members today. Wolfberger combines tradition and constant innovation to elaborate high quality wines and preserve their typicity. The resident oenologist at Wolfberger is Bertrand Praz. A young but extremely capable winemaker, he learned his craft at the famous Dijon wine school and from working at the Mumm Champagne House. He has taken huge strides in raising the quality level here. They also take their evaluative wine tasting very seriously and have a highly efficient set-up for tasters. The amphitheatre style classroom has individual wine-tasting desks each with light, spit bowl and automatic water faucet. Wolfberger is the rare example, in the wine world, of bigger actually being better. Bright and light golden-yellow in color. Exotic and sweet vanilla bean aromatics backed by pear and kiwi with a slight orange peel. The palate resonates with texture and depth as stone minerality and cream brioche to match. Flavors of roasted plantains, gravenstein apple, and lemon zest frame the wine for a long yet soft finish. Planted in the early 90’s, this is the coolest vineyard site in the Russian River Valley, located at Lee Martinelli Sr.’s home ranch in Forestville, CA. After riding around with Lee in his pick-up truck when we visited his Woolsey Road, Zio Tony, and River Road Vineyards, he decided to take me to this gem. He kept this particular vineyard in his back pocket until we hit it off. We did, and I think you’ll enjoy the ride as well. Aromas and flavors of black cherry, black plum, cocoa and baking spice will take you at least 10 fathoms deep as you savor sip after sip. Now, all you have to do is find your latitude and longitude, plot your position, and open this wine!